Unifyed Studio is a self-service mobile app development platform which lets you create your institution’s app without writing a single line of code. It has various dynamic capabilities to change look and feel, display order, branding, etc. in your mobile app. 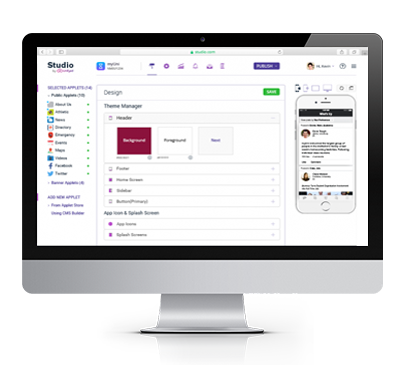 There are multiple configuration parameters of the app that can be controlled from the administration interface of the Studio. The web based emulator on the administrative interface allows the admin to verify the behavior of the app on iOS, Android and Blackberry interfaces. With Unifyed Studio, even users without any technical know-how or proficiency in coding can easily build and launch apps. Unifyed Studio provides you with everything you need to link your custom coded mobile apps with the Unifyed platform. We support the most popular programming languages like Java, Microsoft.NET and PHP. You can change the look and feel, display order, branding, etc. according to your requirements. Unifyed’s ability to interactively evaluate source code and cross platform functionality allows you to concentrate on developing and customizing your app without worrying about platform specific implementations.